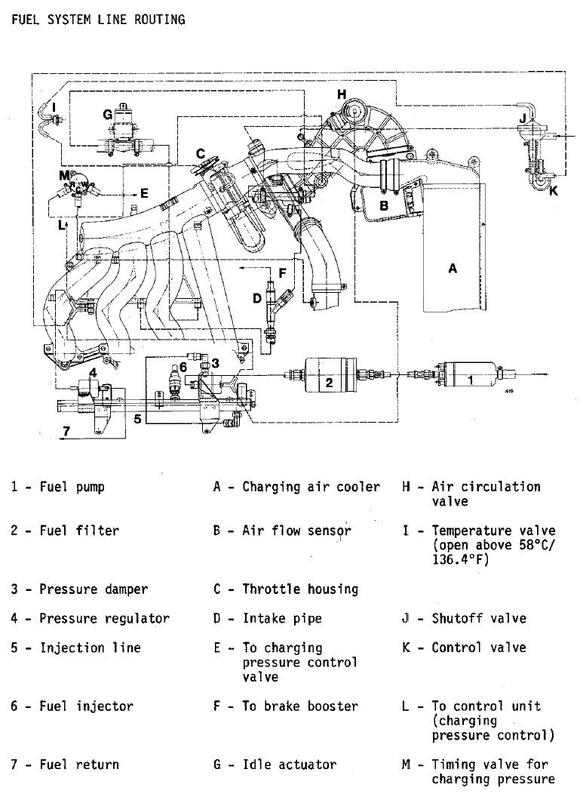 The following fuel system line diagram includes most of the vacuum line routing for 944 Turbos. If the vehicle is equipped with an active carbon tank for fuel tank venting, there will be additional vacuum line routing for that system. Routing for these lines is similar to the carbon tank line routing shown in the 1985.5 N/A 944 fuel and vacuum line routing diagrams. There is also vacuum line routing for the heater control valve and ventilation controls. That vacuum line routing is similar for all 944 models and will be included in a drawing to be developed in the near future.